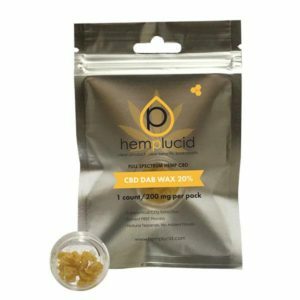 Hemplucid CBD Dab Wax contains 200mg of ultra-refined CBD Full Spectrum Whole-Plant concentrate. They use a supercritical CO2 extraction process, free of solvents that produces a golden yellow CBD wax that is rich in terpenes. The result is an amazingly fast acting effective product and is vastly more potent than many other isolated CBD extracts. Hemplucid’s oils include the diverse components of the natural hemp plant: phytocannabinoids, vitamins and minerals, terpenes, and other phytonutrients, this provides the known therapeutic efficacy associated with full-spectrum hemp.